Pairing shimmery synths and big, relentlessly sticky hooks with emotional torment, Passion Pit have an atypical approach. Danceable yet often inherently dark, their songs toe an odd line between two extremes: jubilance and despair. Nevertheless, the live show is firmly set in the former arena. 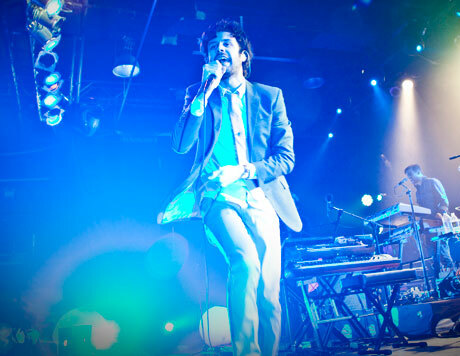 While frontman Michael Angelakos has some well-documented demons, you would never know it from the way he prowled the Kool Haus stage. Out of the gate, "I'll Be Alright" was an apropos mission statement that pitted a cavernous low end against a lofty melody resulting in an emo-infused singalong. Crunchy synths on "The Reeling" and an infectious chorus on "Carried Away" kept the early pace brisk. Inevitably a mid-act slowdown tempered momentum, notably on a surprisingly inert "Moth's Wings." Still, the band fared well with gears other than 5th, especially on mid-tempo breather "It's Not My Fault, I'm Happy" and a Jodeci-influenced "Constant Conversations." Lyrically, the latter is a tortuous, booze-filled domestic affair. Nevertheless, delivered live, it was a get-down song that hardly dissuaded an already-soused crowd. Throughout, Angelakos was the MVP, saving a relatively staid "Cry Like a Ghost" with a vocal incessancy that rose above driving drums. Also, he injected much-needed ardour into "Eyes Like Candles." Surveying the crowd for first-timers, the singer got a huge response. That infusion of new fans has a lot to do with the visceral payoff and joyous sound of tracks like "Take a Walk" — an unsurprising highlight. However, Passion Pit's deeper appeal stems from a surprisingly effective juxtaposition of dark and light. Evidently, all of that anguish makes the writhing more profound.